Sneaky Snakes is a sidescrolling platform game developed by Rare for the Gameboy and published in 1990 by Tradewest. The game is a sequel to Snake Rattle 'n' Roll which was developed for the NES. In Sneaky Snakes the goal is to rescue Sonia Snake from Nasty Nibbler, who captured her. In each level the player has to control a snake, and let the snake grow in both length and weight, by eating Nibbley's. When a certain weight is reached, the level can be cleared. In each level there is a time limit of 99 seconds. The player can extend that time, by collecting clocks. when the time has run out, an axe will chase the player and attack, till the player lost his life. Apart from the clocks, there are other items that can be found such as diamonds (temporarily invincible), tongue extender, increased jump height. 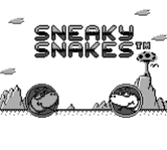 With two gameboy's and two copies of Sneaky Snakes two players can team up, where each player controls their own snake.